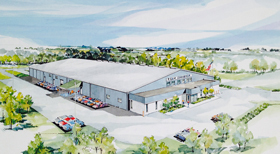 C&M Conveyor announced today a $2.7 Million investment on a building expansion to consolidate its manufacturing operations in Mitchell, IN and to open a new engineering/design center in Bloomington, IN. “Bringing all of our manufacturing under one roof will provide the company with a more efficient work flow and greater flexibility to respond to future customer requests,” said Don Laipple, CEO. C&M’s investment in growth started in early 2013 with the appointment of eight new associates to key management positions. In addition, the company has made significant investment over the past 18 months in advanced manufacturing processes, engineering hardware and software and shop floor equipment.